What to know: This Halloween is very special for good old' Charlie Brown. "I want to stay out like Linus." "Lucy is mean." 'I want to be a ghost for Halloween." "I want to see the Great Pumpkin." "Great show from our childhood we can enjoy with our children." "Good old-fashioned fun and silliness." "It sure is fun when Charlie Brown and his Peanuts pals get together for the big Halloween celebration. In fact, it's downright spooktacular in a feature whose bag of treats overflows with 'charm, wit and wisdom.'" (Hollywood Reporter). 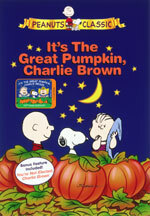 This Halloween is very special for good old' Charlie Brown. He's finally been invited to a party! Snoopy gets to join the fun, so look out, Red Baron! Linus will find out once and for all if the Great Pumpkin will rise up out of his pumpkin patch "with his bag of toys for all the good children." Nominated for an Emmy award, "It's the Great Pumpkin, Charlie Brown" is digitally mastered for excellent sound and picture quality. This classic made-for-TV movie from 1966 is directed by Bill Melendez; written by Charles M. Schulz; stating Peter Robbins as Charlie Brown, Chris Shea as Linus, Sally Dryer as Lucy and Cathy Steinberg as Sally Brown.